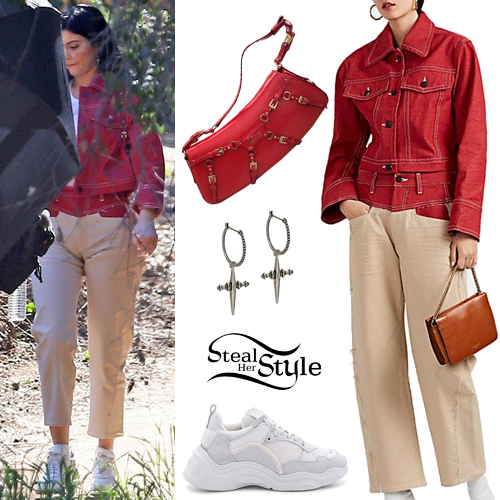 Kylie Jenner was spotted leaving Barney’s New York in Beverly Hills wearing a Theory Quilted-Down Jacket ($499.00), joggers like these from PrettyLittleThing ($35.00), the Hermès Kelly 28 Himalayan Crocodile Palladium Hardware Tote Bag ($145,000.00) and IRO Curverunner Sneakers ($453.60). Kylie Jenner posted a picture on her instagram stories wearing a My Mym Made It Cream Faux Fur Robe Coat ($160.00), RtA Glossy Skinny Trousers ($264.00) and IRO Curverunner Sneakers ($596.00). Kylie Jenner posted some pictures on instagram wearing a Valentino Cropped Wool and Cashmere Blend Turtleneck Sweater (Sold Out), Frame for FWRD Leather Trench Coat ($2,495.00), Levi’s 501 Jeans ($149.95) and IRO Curverunner Sneakers ($596.00). Kylie Jenner was spotted arriving at her Dover Street Market Pop-up event wearing an IRO Legend Jumpsuit ($1,085.00), Christian Dior Shearling Fur and Leather Saddle Bag (Sold Out) and Yeezy Season 6 Boots ($403.00 – wrong color). Kylie Jenner was spotted leaving her hotel in New York wearing an Off-White C/O Virgil Abloh Bear Faux Shearling Jacket ($833.00), Travis Scott Astroworld Europe Put On A Happy Face Guys Tee ($100.00), Paula Knorr Spring 2018 Pants (Not available online), a vintage Christian Dior Animal Printed Pony Hair Saddle Bag (Sold Out), Luv Aj Palermo Hoops ($75.00) and IRO Curverunner Sneakers ($596.00).